30th. July. My 21st. birthday. Lot of knocking about Eerie Camp. Champagne Dinner at night. Had to go away at 11.30 p.m. with my 50 Argyll stretcher bearers. Got them on the move and moved up towards the 'show' which would begin in a few hours time. Another officer and 50 men of the 13th. Royal Scots now joined my party so I had 100 men. Got to Bivouac Camp. We were now all ready for the show. Felt things strange of course. Although I had by this time begun to dread this corner of the earth I did not feel the least bit afraid. In previous shows I had gone into action feeling that I would come out again. This time I had no such feeling. Felt, almost knew, that I would not come out again. Did not, however, leave any addresses or messages behind because I believed it unlucky. [So many officers had gone into action who had left addresses to be notified that it became looked upon by me, at any rate, as an ominous sign, e.g. Alan Whyte, and in this show, MacCallum.]. As we marched along, I felt quite cheerful, in spite of this somewhat melancholy reflection, and would not consciously have wished myself anywhere else. Soon, I became so engrossed, that I lost every outside thought, and could only think of the present business. No regrets for the past, and no fears for the future worried me. I mention this psychological state of mine because never in any previous or subsequent battle did I go into action with the same nonchalance combined with the feeling that I was not coming out again and the feeling only lasted the length of the march, being soon replaced by others. Hefty bombardment at 3.50 a.m. on 31st. when the offensive opened. We got shelled a bit in the afternoon. An R.E. was killed amongst my party and several wounded. I had only one man wounded. Bother about rations which did not arrive until about 6.20 so that I had to march off leaving a party behind to bring them on. Moved up to the Ecole, Ypres. This is where a whole company of the Camerons were gassed a few days previously. No shelling at this time. Heard we had taken the Green Line but that the Division on the right had failed us - I got astonishing confirmation of this later from McClure who had to shoot some of the beggars to prevent them running back. Reported to Menin Gate for duty with my party. Found we were not wanted until 4 a.m.
Wed. 1st. Aug. My H.Q. are in the Ecole. The men are in a cellar, indescribably filthy, with an awful odour and three inches deep in water. Here they have to rest, sleep and eat if they can. I should be down with them but preferred risking it above ground in a tin hut (which was constantly being shelled) behind a broken down wall. A pip-squeak could have finished it and me. I've read so many descriptions in newspapers of the ruin and desolation caused in this war. Famous literary men have tried their powers of description and All (with the possible exception of Gilbert Frankau) have failed to convey the repulsiveness and awfulness of the scene. The Ecole was one of these places - That's all! Began work at 3.15 a.m. - a cheerless hour. It was raining I think. Moved up. Searched ground up to Blue Line. Terrific rain, heavy and prolonged. Ground churned up. We could scarcely move one foot after the other. Our job was to carry down wounded. This is my first job as a bearer. I hope to goodness it is my last - prefer going over the top. Heard about the Battalion. MacCallum killed. I'll have to write to his girl. Also Leitch and D.R.Cameron, Gray and Robinson and Sinclair wounded. We took Green Line but had to retire on our right, as that flank was in the air. Division on our right driven back. Losses not apparently heavier than we expected. Huns well prepared for us. You can't lay out ferro-concrete blockhouses with anything less than a 12 inch gun. And we never see them. Tuesday 2nd. August. Clothes in bad state with mud. Moved off again at 11 a.m. - nobody rested - in response to an urgent message. Had to snake a way through three very bad barrages on the way up. I found openings in them more by good luck than anything else. Must have been a terrible strain on those behind, in the rear of our party. I had them in single file, and we could only move slowly. Rested them two minutes in recent No Man's Land but had to get them on the move forward. It wasn't safe to stand. Never before have I seen artillery fire like this. The Somme was a picnic and Arras a joke compared to Ypres just now. Escaped with only one casualty or so. Got to blockhouse on top of Frezenberg Ridge. Barrage closed down all around us. Took down wounded. Sent off men in parties until I had only three left. Found at last, when no other of our men could be seen, a demented wounded Boche. Felt like leaving the blighter, but could not. Got him on a stretcher. But men objected. Took an end of the stretcher myself. Then Boche turned a machine gun on us as our little party with the wounded Boche stumbled down the Roulers Railway Line. So much for civilised warfare! I fear that no prisoners will be taken by any of my men in the next show. Dumped the Boche at an 8th. Division dressing station and got a Britisher in exchange. Cruel work for men with a stretcher, owing to mud, and holes, and wire. Thank God I'm not permanently in the R.A.M.C. bearer section, and with a conscience. Finally got back, physically useless, to l'Ecole at 5 p.m. or so. Bombarded all night with messages, so got no sleep. Here, I have in this party, a sergeant, Sgt. McQuarrie, of 'D' Coy., one of the bravest and best gentlemen I have ever met. He has been utterly invaluable to me on this job. Lord knows all he has done. He'll certainly not get his deserts in this world. I have more respect for this man than for any other dozen I have ever met. Friday. 3rd. August. Trouble with my men. Had to rout them out myself. The poor beggars, were, of course, done up and many wanted to parade sick. Harangued them in my best (sorry it should have been necessary). Got them out by 5 a.m. Went up with Colonel Worthington to see how things were. He was almost as filthy a sight as myself, and I must say, from what I saw of him, he proved himself a splendid officer in battle. He didn't seem to care a damn where he went. All the same he wasn't any further forward than I had my men yesterday. Got down nearly all the wounded. Sgt. McQuarrie and myself had an awfully narrow escape from a 5.9". We were going back, at the end of the day - all the men had preceded us - down a cobbled road, when a 5.9" burst on the road with an awful noise about 5 yards - not more - behind us. No theory ever invented will account for our escape. Went to a blockhouse. Found it stuffed with R.A.M.C. bearers under a sergeant. During the three days I had been in the forward zone I had not seen any R.A.M.C. bearers. It may have been because I was too busy - but I didn't see them. Now my temper simply boiled over at the thought of it. I had those fellows out of that blockhouse quicker than they got in, and striking for the front line. My threat to use my revolver and my looks (as tho I meant it) settled the question. As soon as I got them outside a shell dropped among them, and four were saved the trouble of going forward - they went back on stretchers! When I got back to the Ecole I found that most of my men, who were back long before me, had been taken by some 15th. Divisional staff officer, shoved into buses and taken Lord knows where. So McQuarrie, a few drifters and myself were left to spend another night in the Ecole. We had jam and cocoa for dinner. Saturday 4th. August. Paraded about 6 a.m. Walked through Ypres, the Hun not forgetting to put shrapnel over us as we marched out at the Station Gate. Was he not laughing at us? Situation quiet. By dint of stopping lorries and buses I managed to get my party of 16 off to Winnezeele, behind Watou, fairly quickly. Reached Bn. about 11 a.m., a bit tired, and certainly unclean, and reported for duty and for breakfast. Took things easy all day. Couldn't change, as my valise was lost. The Q.M. had left it somewhere. Sunday 5th. Traced my valise to 7th. Camerons. Found it, less a glengarry and field glasses. Got some sleep at night. Monday 6th. Lot of work in Orderly Room. Toothache. The officers' recommendation for the show are Capt. Matt Wilson, Capt. McClure, Lieut. J.F.C.Cameron, Sorley and Colin Mitchell (this last did exceedingly well), and I think Prosser later on. 31st. July, 1917. Zero hour 3.50 a.m. when a terrific thunderclap of fire broke out. The sky was lit by dozens of flashes at the same time so that it seemed light. Our Division, the 15th., attacked just north of the Ypres-Roulers Railway on a two Brigade front. 44th. Highland on left, 46th. on right, and our 45th. in support behind Ypres. Our brigade, 45th. 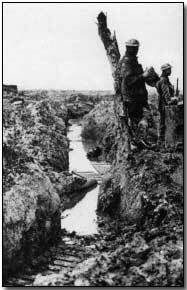 moved off at zero by the corduroy track south of Ypres and formed up in "No Man's Land" at zero hour. They then advanced through the 44th. and 46th. Brigades to attack the Green Line. The 44th. and 46th. were consolidating on the Blue Line. The 45th. did their work well and in good style, but the division on our right (8th. Divn.) could not get level with us. When some of them did get up, they fell back again and one of our captains had to go over and use his revolver against one, as an example. Still, our right flank remained hanging in the air. The Argylls and Fusiliers did quite well. Poor MacCallum was killed, shot by a sniper. Captain Leitch, a splendid, frank, and popular officer and D.R. Cameron were both killed. Miller (A.S.) and Sinclair were wounded. The Battalion was relieved that night by Gordons who had to fall back a little. The Argylls were brought back to the old British front line, but they had to go up next night (the 1st/2nd) for a counter attack. They advanced in utter and complete darkness - no moon or stars - and took the position allotted to them correctly, being the only battalion in the Brigade to do so, so we must confess there may have been a certain amount of luck in their move. They dug in, in front, without losing any men, while the other three battalions were a little unfortunate in losing some men. Our losses from 31st. were 4 officers killed and 5 wounded, and 140 - 150 other ranks. The C.O. Major Duncan - I'm told on all hands - was a perfect marvel and showed a total disregard for danger. He went about waving a huge signalling flag above his head so that ALL his men might spot the whereabouts of his Battalion H.Q. Unfortunately a Hun aeroplane spotted the flag, and brought the Hun artillery on to it, and suppressed him for the nonce. His disregard for danger was like the disregard of a religious maniac for death. What a pity he lacks that most necessary of all things - even before bravery - common sense and 'savoir faire'. In regard to my own party, I was relieved and happy when the work was done. The R.A.M.C. men were not up to scratch. Fortunately, I must and can say that their officers were splendid, above all was their C.O., Colonel Worthington who richly merited the D.S.O. he got for that day. I saw him on the Frezenberg Ridge in the midst of a barrage, and if it had not been rather dangerous I would have lifted my steel helmet to him! My instructions, and they were never changed, were to carry wounded in the back areas, which would have been easy, but the R.A.M.C. asked us to do the forward areas, and we did it. I didn't mind where we carried, but the R.A.M.C. did not play up to us. The R.A.M.C. doctors - particularly Captain M---, agreed with this. My own men, with one exception, were simply glorious, in conditions so tiring, so demoralising and so dangerous that the Somme and Arras offensives (as far as my judgment goes) were almost as picnics to this one. The carrying alone, through the mud and up and down shell holes and through barbed wire, was in itself absolute torture, as I found to my cost when I had to supply a gap in the last party. Monday 6th. Wrote a letter or two. Macleod, the adjutant, turned to me tonight in the Orderly Room and told me that Sergeant McQuarrie of 'D' Coy, who was in my R.A.M.C. party had come up to him, on behalf of the men of the party to ask him to tell the C.O. how well I had done or something or other in the way of work during these barrages. Felt very bucked at such a thing coming so spontaneously from the men, though it is all nonsense, for I 'had the wind up' all the time. Macleod, I believe told the C.O. Note from RLM, 1972: In a quite fortuitous conversation a year later with Quarter Master, I learned that the men had recommended that I should receive a decoration for the show, but the C.O. had considered it grossly irregular that the men should do such a thing, and the matter dropped. But I was aware at the time, somehow, that the attitude of the older majors and captains towards me had changed, and they had now accepted me as one of themselves, an original, proved member of the Battalion, and not an untried interloper. Their speech lost a curious harsh element or tolerance, and was replaced by a still more unexpected understanding. Such was the 'esprit de corps' of the 11th. Battalion Argylls. Tuesday, 7th. August. Hard at work all day. Finished late at night. Battalion getting big drafts, of very fine looking men too - brand new to this life - poor devils! Wednesday 8th. Inspection by Divl. General Thuillier, who said a few nice things. Thursday 9th. Rode over to Steenvoorde for dinner with Tobermory Maclean. 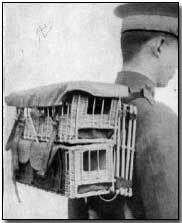 Appointed Signalling Officer for about the 8th. time. Saturday 11th. Rode to Steenvoorde with Prosser in the evening. Heavy rain. Learned that Mackay of the Camerons was missing. Understand that we have to go into the line again. Another "Horoosh". Sunday 12th. August. Church parade. New minister. Rather enjoyed the sermon. Easy afternoon. Finished Vol. 1 of the Browning Letters - rather a feat for Active Service! Monday 13th. A chit came in through Division H.Q. from the A.D.M.S. saying that the three officers i/c the Brigade stretcher parties were being brought to the notice of the Divisional General for their good work, and I happened to be one. Don't know what to think about it, because of the men. Pleased on the whole that the R.A.M.C. should take notice. Field General Courts Martial. 2 cases. Tuesday 14th. F.G.C.M.s - 4 cases. Very boring. We move up again on Thursday 16th. Wednesday 15th. August, 1917. This was the night when I rode to Cassel with Smith when he lost his cap, his stirrups and control of his horse, and the Colonel, his temper. It's not worth while trying to play John Gilpin these days - though it is just as funny for the onlookers. Two more F.G.C.Ms. and yet we are not a bad battalion, as battalions go. Thursday 16th. Very busy morning. Heard that 16th. 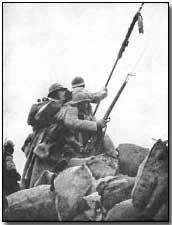 Irish Division had taken the Green Line and that we are to relieve them, and do a "horoosh" as the men call it. Hope it will be successful. Moved off from Winniezeele at 2 p.m. Very fine warm afternoon. Got to Toronto Camp about 7 p.m. Saw Nairn of the Gordons on my way up. He's a funny little devil. 17/18th. Tremendously busy. Conferences until late at night. Brigade has rather a rotten task before it. 16th. Division have not been able to get forward at all. Sunday 18th. Work at top pressure. Tremendous lot of 'stuff' in from Brigade (Paper). At night moved up to map square H17a. Got up safely; bombed at night. Still more midnight conferences. Signalling arrangements for the show completed. Monday 20th. The balloon just above our heads shelled by 9.4" - pieces falling all around us. The Boche are good gunners - the more I see of them the more admiration I have for them (in a way!). A temporary Medical Officer - would that we had Jimmy Dickson! Went on ahead at 4 p.m. with pioneers, signallers etc. to Bill Cottage. A 'windy' passage up the line. Looked round successfully for signal wire. Fine night. Had a slight dinner with the K.O.S.B. Their H.Q. - the worst I've seen for a bit - to wit, a piece of cloth or canvas tied to the lee-side of a broken wall. No landmarks near. A bad spot to find in the dark. Wandered right up to the front line. No communication trenches here, no trenches or any kind - only MUD! Don't think that hell itself can be worse than this place. Laid my line with Signaller Start (a magnificent fellow) and another, a mile long at least. Got shelled to blazes. Took us 5 1/2 hours. We should in theory have been killed in laying this Low Farm line. Got back to Bill Cot at 1 a.m. If I were a millionaire I would take all my signalling section on to my staff. Don't know whether I could get a better amongst them, since they're Argylls - but for dangerous or any other work I'd back them against any others. 21st. 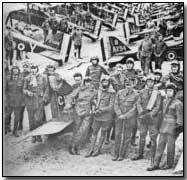 August 1917. When I got back I fell into a farm muck pond which I had not seen. Took me up to the arm pits. Took off my kilt and slept as well as I could. In the morning the sun came out and dried it, i.e. the kilt. Boche planes over, and more paper from Brigade. When will we be able to run a war without paper? Heavy shelling round H.Q. Moved up H.Q. to front line at Low Farm. Low Farm is not a white-washed cottage, but is a filthy, waterlogged Boche pill-box, about 4 feet high. Its western wall is intact, solid and windowless, so that we need not fear our own guns! Its eastern wall is not intact, is not solid, and it possesses windows, through which the Boche sends M.G. bullets - we actually had two or three men who were sitting on the floor inside the cottage wounded by bullets coming in through the window and they were almost level with the ground - of course, Boches were only a few yards away, about 100 to 150, in Beck House and Borry Farm. The door faced the South and was half-blocked by a stone which was an important factor when you consider that Boche had a M.G. trained on it and it took you ten to twenty seconds, according to your girth and accoutrements, to wriggle inside. The inside dimensions were those of a decent caravan, but half the height, and 30 men were crowded inside it. This is the first farm I've ever stayed at! 21st/22nd. I was on the move along the line, at intervals, the whole night. It was a dark, black, creepy night and the Hun was very 'windy' indeed. He put practice barrages on us frequently, and nasty things they were. The Bn. was formed up alright, and tapes laid out by the Officers i/c Coys. O.C. Coys. gathered in this wretched farm for a final talk before the attack. Captain Porteous, O.C. 'D' Coy. was shot through the head, and Billy McClure said it was his duty to take over command of 'D' Coy, which he did immediately. Our men began to assemble for the attack while it was still dark. It was terribly difficult work, for the Hun seemed nervous. He either knew or suspected an attack. He put a particularly damnable barrage on our lines at 3.30, while at 4.35 a.m. he again let loose. In the interval Billy MacClure walked into the enemy's lines in the dark. His servant was taken prisoner, but he himself escaped with a bullet through his steel helmet. Ye Gods! Some men have all the luck! Zero Hour was 4.45 a.m. and was a sight I will never forget. God knows how anybody got over at all. This continued for half an hour, when the light was just making itself apparent. Then we noticed a few Royal Scots fall back, and then, nearer us, one or two Argylls. More and more came, so J.F.C.Cameron got his Lewis gun ready and looked after the left half of our front. I took the right half, intending to stop the men, and get them to reform, or if necessary, to dig in where they were. At this time I noticed large numbers of Boche, and a counter-attack was developing on us, and across our front from the direction of Zevencote. The Boche were really getting busy, and their snipers made it difficult to move. I had to go at the double all the time - that, however, did not mean much as the bits of wire, and the mud and other obstructions made me relatively slow. Got all our fellows who remained, (the others I could not but presume to be either dead or wounded or prisoners), together and spread them out with guns along about 500 yards parallel to the Frezenberg-Beck House Road. Our attack on Beck House and Borry Farm was a failure. These places could not be touched by our artillery. A big shell of ours could bounce off them! Their garrison probably exceeded that of our battalion. J.F.C.Cameron, in his escapade of the previous day when he got within 30 yards of Beck House found it garrisoned, and saw about another 50 men enter it. After what seemed a long journey I got in touch on the right with the H.Q. of the Royal Scots. Their H.Q. was as bad as our own. I had to enter all doubled up, but the poor fellow who followed, a Scot, almost at my heels, was shot by a sniper, through the head. The sniper was some 50 yards off. Gradually we got a grip of things and organised a decent but terribly weak line. Boche gave us a thin time of it with his sniping and shelling. Once I could not help feeling amused. Boche started shelling with light stuff, and I had to get down behind a wall, or rather a bit of a wall. Then our fellows started shelling with heavy stuff which fell short, and I had to crawl round to the other side of the wall, i.e. the Boche side. J.F.C. on the left flank did glorious work. His sang froid was extraordinary. He had rather a bad bit of line with a nasty big curve in it. He and his sergeant, a tough named Flynn, well deserved the honours they got for the show. Not an officer of ours came back, except McClure, Chesney and Muirhead, and they were all badly wounded. I got the drink and ammunition problem settled by darkness - a difficult business. At night our gunners put down a terrific barrage which cheered us up considerably. Boche replied with another one, but as his shells fell behind us we merely sat still and watched it. Square Farm behind us got a terrific dose. Some of our men were said to be still in front (so Brigade told us from the rear) but we could not get any trace of them, except one or two on the right of my part of the line. Note from RLM, 1972: I remember we got a message from Brigade at this time saying that Square Farm was being attacked by Boche. This FARM was a good 1/4 mile behind us! The message ended with "Please Explain". The 6th. Camerons blew up in detachments at midnight. They were to attack Beck and Borry again, and were supposed to go through us. I sat on the ground and watched them file past in the darkness. Their attack, like our own, proved a failure. One company lost itself, the remainder dug in on the left part of our line. They had only 70 casualties. I fail to see how they could have taken the position, or any position, from the way in which they passed me. Their men didn't get a chance. Macleod was rather amusing once here. In the afternoon, he decided to take a trip along my part of the line. He went for 200 - 300 yards, and saw all that was to be seen, but the Boche played with him as much as they did with me. He arrived back at H.Q. absolutely breathless, but instead of appearing horror struck or disheartened with what he saw, and with the day's failure his first and only remark was "Well, Thank God it isn't raining". 23rd. My knees began to give trouble. I had fallen several times on top of barbed wire which instead of scratching me went in right through the skin. They swelled up greatly, and to crown all, stiffened completely, so that in moving I seemed to be on crutches. They also got a bit painful. The runners did glorious work. How these men stuck it I don't know. All my signalling schemes came to naught - a 6 inch cable wouldn't have stood for three minutes in the artillery fire! We used pigeons with effect. The C.O. (Major Wilson) and Macleod moved back to Bill Cot on the 22/23rd. about dawn, on Brigade orders. These two fellows, MacLeod and Wilson, are the finest soldiers, the most efficient officers and the truest gentlemen I have ever met. The C.O. Major Wilson, came back again in the afternoon, and ordered me down to hospital or to the Casualty Clearing Station. I went about nightfall - 8 o'clock, with Wright my servant. Missed a beautiful crump - one of those big, black, solitary ones that come for no apparent reason, by...well, it seemed inches, although it must have been 40 yards, in the open. Got a limber through Potize to the Field Ambulance at Vlamertinghe, and J.F.C. was left alone in command of the line! Got a A.T.S. injection. I believe I did a bit of talking at that C.C.S. I still smelt smoke. Got a car out of them to take me to Toronto Camp where I arrived about midnight on the 23/24th, still talking a bit! The battalion was relieved an hour or two after I left it, so J.F.C. was not so unlucky as I felt he would be. Bn. got train from Ypres and arrived at Toronto Camp shortly after me. 24th. August. So tired I could scarcely sleep. 25th. Bn. ordered to the line again for 26th. C.O. ordered me to stay where I was. I fear I could not have walked a hundred yards anyway, but was terribly sorry to see the battalion go off without me. Bn. is ordered to do a raid on Beck House and Borry Farm. The C.O. managed to change personnel a bit to save the men. The idea of sending men in such a state as our brigade was in - for the third time in three weeks - was preposterous. Fortunately the weather broke completely, and the scheme fizzled out, but the Brigade had a disagreeable three days the 27th. to 29th. Bn. came back to Toronto on the 30th. Not feeling particularly bright these days. Suppose it's leave I need. 31st. Moving to Wormhout, the first stage of the journey of the Division back to the Arras Front. Thankful to quit the Ypres Salient.